February 1, 2017 Michal B.
Wenceslas Square (“Václavské náměstí” or familiarly “Václavák” in Czech) is a 700 metre long and 60 metre wide boulevard in Prague’s New Town (“Nové Město”) quarter. Formerly it was called “Horse Market” (“Koňský trh”), because of its original purpose. The modern name refers to probably the most significant Czech patron saint, Wenceslaus (“Svatý Václav”). Nowadays, Wenceslas Square is Prague’s cultural and business centre. During the history of Bohemia it witnessed many significant historical events, since it is a traditional venue for demonstrations, celebrations, and other mass gatherings. The Wenceslas Square was set up as part of the project of the New Town of Prague (“Nové město pražské”), decreed by the celebrated King of Bohemia and Holy Roman Emperor Charles IV himself in 1348. It was intended to be one of the main marketplaces of Prague. The original name, “Horse Market” (due to regular horse markets taking place there in the Middle Ages), was changed to Saint Wenceslas square in 1848. Nowadays, Wenceslas Square is, among other things, a traditional meeting point for the citizens of Prague. They often say “let’s meet at the horse” or “under the tail”, referring to the famous statue of Saint Wenceslas on a horse. The square is one of Prague’s most popular centres of culture, shopping and dining. The above mentioned bronze equestrian statue of Saint Wenceslas was created by Czech sculptor and medallist Josef Václav Myslbek in 1913. It was placed at the top of the square, in front of the main building of the National Museum, which was built between 1885 and 1890. The statue displays St. Wenceslas with other Czech patron saints. On the pedestal you can find writing, saying (in Czech, of course): “Saint Wenceslas, duke of the Czech land, prince of ours, do not let perish us nor our descendants.” The sculptural group became soon the symbol of Czech nationhood. 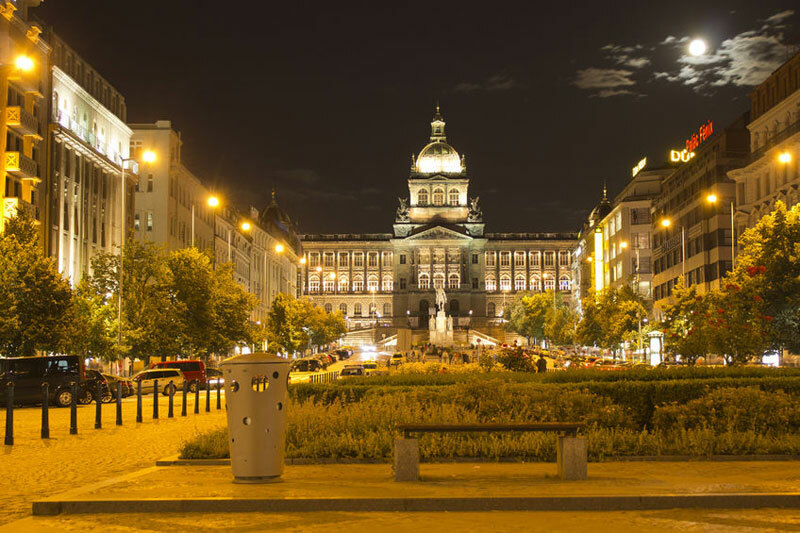 As we already mentioned, Wenceslas Square has been the venue of many significant historical events. Let us mention the most important ones. Standing in front of the St. Wenceslas statue, the famous Czech writer and politician Alois Jirásek read a document enunciating the founding of independent Czechoslovakia, in 1918. The crowds watching this milestone event in Bohemian history were holding Czech flags and pictures of the founder and first President of Czechoslovakia Tomáš Garrigue Masaryk in their hands. During the German occupation of Czechoslovakia within the World War II, the Nazis used Wenceslas Square for mass demonstrations and propaganda. At the end of the war, when the Prague uprising took place, many fights happened at the Square. Several buildings in the area were destroyed as the Czech people fought the Nazi troops. When the war was over, the peaceful period of the Czech history unfortunately did not last long. In 1948, the Communist regime took power. Later on, when the Czechs tried to reform the regime, their efforts were suppressed by a military engagement – the Warsaw Pact invasion of Czechoslovakia. In 1968 the occupation (one of the darkest eras of Bohemian history) started, among other things with Soviet military armed vehicles driving onto Wenceslas Square. The tanks shot at the building of the National Museum, thinking it was the Czech Radio building, and the historical building was severely damaged. In January 1969, a Czech student called Jan Palach committed self-immolation as a protest against the invasion. Remembering his heroic act was part of the Czech students’ and other Czechs’ strong motivation for the liberation activities in the late 80s. And Jan Palach will never be forgotten; in 1989 his memorial was placed in front of the National Museum. Finally, in 1989, Wenceslas Square was the venue of many public speeches against the Communist regime. The processes of opposition to the lack of freedom culminated in November, when there were over a hundred thousand people taking part in the demonstrations. When, as the result of the “Velvet revolution”, Communism was finally toppled in Czechoslovakia, Wenceslas Square was one of the venues of celebration. 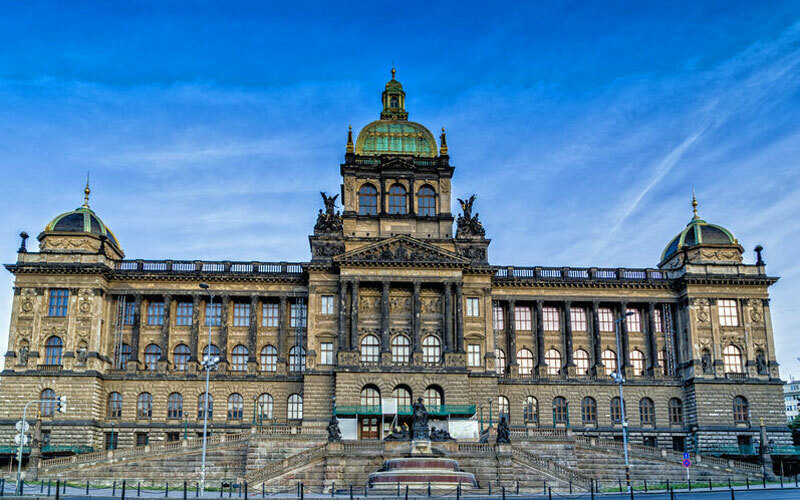 The above mentioned main building of the National Museum, located at the top of Wenceslas Square, is probably the most important structure on Wenceslas Square. The Neo-Renaissance building is currently closed for a long-planned reconstruction. The re-opening of the historical building is set to happen in 2018, when the National Museum will celebrate 200 years of its existence. The National Museum is the most significant Czech museum institution. For more information read our full article about the Czech National Museum. The shops are placed along both sides of the boulevard, and when you are tired you can rest either in one of the many cafés or restaurants, or just sit on a bench in the centre of the square. A significant part of Wenceslas square is nowadays a pedestrian precinct, which contributes to the fact that so many people like to spend their leisure time there, shopping, meeting friends, or just strolling. After dark, Wenceslas Square turns into a nightlife centre. There are many clubs in the square or on the streets around it. 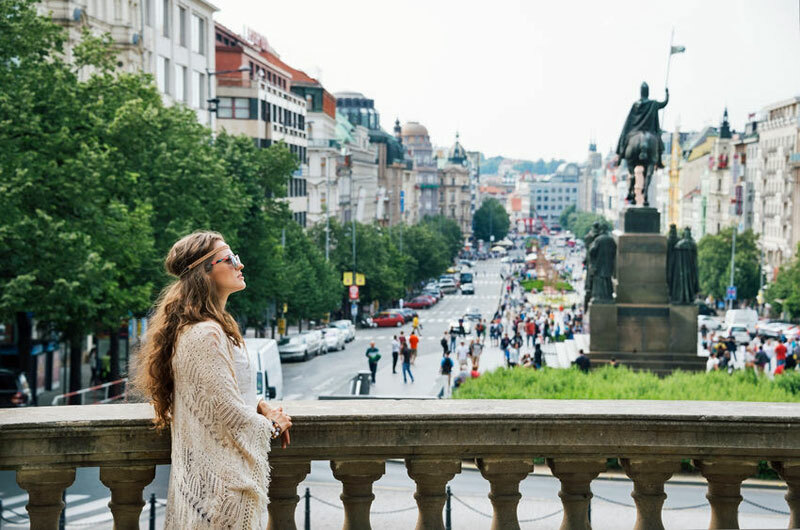 Prague in general is, among other things, considered to be a “night-life metropolis” and many young tourists come to the Czech Republic’s capital to party. The variety of bars, clubs, and restaurants with late night opening hours is great, so everyone can easily find a place to drink, eat, dance and have fun according to their taste. Wenceslas Square is located between Prague’s “magistrála” (the main route going through the city) and “Na Příkopě” street. From the lower part of the square, one can easily walk to the Old Town. Since the square is a significant Prague centre, there are two transit stations connecting different metro lines. In the upper part of Wenceslas Square, there is the “Muzeum” metro station, connecting lines A and C, and at the other end of the boulevard, there is the “Můstek” metro station, where metro lines A and B meet. In the middle of the square, there are also tram stations. Wenceslas Square is open to the public every day, 24 hours, with no restrictions. Also, there is no entrance fee and you don’t need any tickets. Just come and see the beauty.